A core element of successful customer engagement is not just a comprehensive understanding of an individual’s preferences and interests, but also any and all interactions with your brand. That sounds basic enough when dealing with known customers, but the critical piece is the ability to associate previously anonymous behavior with those known customers. 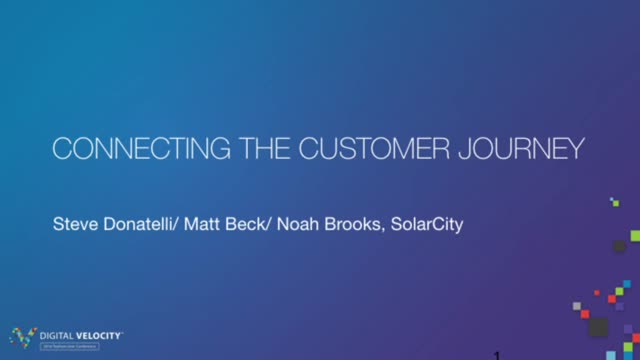 In this session, Steve Donatelli and team of SolarCity detail the arduous process of stitching together data across systems – including web analytics, customer relationship management (CRM), and digital marketing applications – to finally build a comprehensive view of the customer journey for the first time. They also explore the profound impact of this unified customer view on their business, from better understanding hits and misses to lower acquisition costs.